Black flip-open business card holder with white engraved imprint. Black pen with engraved imprint and silver accents. Packaged in nice black box. 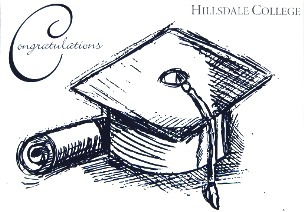 White and navy blue Graduation card. Inside reads: "Congratulations on a job well done!" Envelope included. Size: 5: x 7". 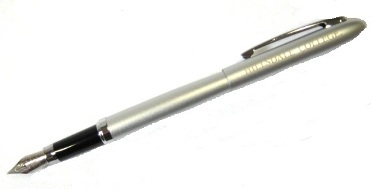 Silver fountain pen with laser engraved imprint. Extra refill included. 5x7 blank note card with full-color photo of Central Hall. Sold single with white envelope. 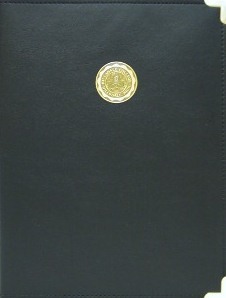 Black padholder with Hillsdale College Seal medallion and brass corners. Pockets and pen/pencil holder on inside front cover. Comes with white lined legal pad. Size: 9-1/4" x 12" high. 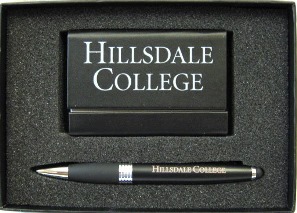 Navy blue pen/stylus with white imprint. Black and silver accents. Black ink. Round navy blue pencil with white imprint. 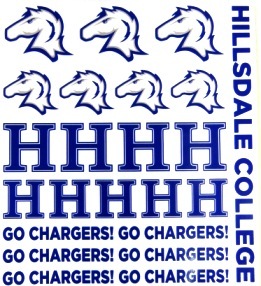 Multi-logo sticker sheet has navy blue, gray and white horse head, navy blue and white H, navy blue Go Charger! 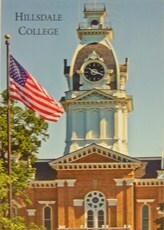 and navy blue Hillsdale College. Great for scrapbooking, binders, phones, and computers. Not for outdoor use.